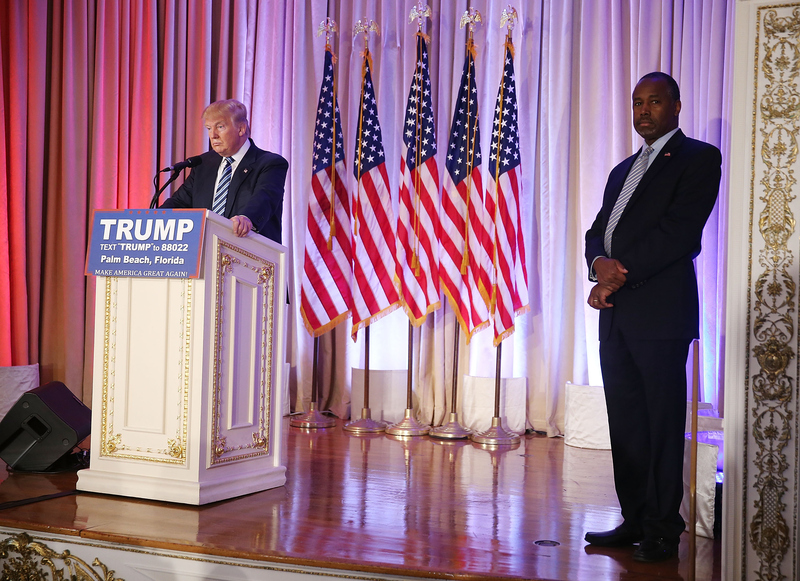 Former GOP presidential candidate and retired neurosurgeon Ben Carson endorsed Donald Trump on Friday, Mar. 11. The formal endorsement was somewhat of a surprise, as Carson, who is fairly quiet and seemingly level-headed, threw his support behind the volatile and outspoken GOP front-runner. During his speech, Carson clarified that he wants "the voice of the people to be heard," but his expressions spoke louder than his words, so we're left wondering: What was Carson thinking while endorsing Trump? It's similar to when Chris Christie endorsed Trump; he said a lot of things that Trump wanted to hear, but Christie was probably silently asking himself, "Why did I do this?" The Internet quickly took to trying to figure out what was really going on in Christie's head during that endorsement. Christie's many confused facial expressions gave us a glimpse into his inner thoughts, and Carson followed suit when he gave his Trump endorsement speech. Sure, Carson said things like Trump is "actually a very intelligent man who cares deeply about America," but we know better than to believe that. With the same low level of energy that Carson carried his campaign this year, he took the stage to tell the world of his new favorite candidate. Here's what Carson and Trump were probably really thinking during the endorsement speech. Trump (probably): MIAMI! Are you ready to hear from your favorite retired neurosurgeon, Ben Carson? *crowd boos* Ha ha! I've taught you well. But no booing this time because I'm receiving Dr. Carson's endorsement today. I know, I know — I could barely remember who he was when we met to discuss his endorsement, but he's here! He woke up from his months-long campaign nap to read you a bedtime story that goes something like, "Donald Trump for president!" Carson: Someone remind me why I'm endorsing this buffoon who continues to insult me? Oh, yeah: "We buried the hatchet. We buried the hatchet. We. Buried. The. Hatchet." Trump: Just look at him back there, waiting patiently to give his forced endorsement speech. So weak! I wonder if he knows I think he's a total loser? Carson: Prolonged eye contact makes me uncomfortable. When is this misery going to end? Trump: Aaaaand another failed presidential candidate drinks the Trump Kool-Aid. Right this way, Bob Carson — er, I mean Ben. Carson: Maybe if I smile the people won't be able to tell I'm crying on the inside? "Endorse Trump," they said. "It'll be fun," they said. Trump: I thought I knew the best words, but I don't understand half of the words coming out of his mouth. This guy really is smart! But I'd never admit that out loud. Carson: Whoever wrote this speech and decided that I should call Trump "very cerebral" is an idiot. Trump is the farthest thing from cerebral; he probably doesn't even know what that word means. Carson: I really hope my parents aren't watching this. Trump: Well, that was easy. Carson: I'm headed to the bar to have a stiff drink with Christie. Trump: Making America Great Again, one endorsement at a time. Carson: Where's the nearest exit?